– Towing capacity: 9,000-plus lb. Give it up for the Ram! Top to bottom, this is the model to beat. Chrysler is a perennial third-place finisher in the domestic-truck sales battles, which means that these new Rams are the product of a striver mentality. Chrysler knows that, unlike with a Ford or a Chevy, you probably won’t buy its truck out of habit or hallowed family tradition. So it wants to give you other reasons, compelling technological reasons, for joining the Mopar crowd. And there are certainly plenty of those. The Ram is the only pickup with a ZF eight-speed automatic transmission, a device so manifestly excellent that Rolls-Royce and Range Rover put the same one in their cars, too. That transmission can be bolted to a satisfying 305-hp V-6, a beastly Hemi V-8, or a 3.0-liter diesel, the only small diesel you can get in a full-size truck. The Ram EcoDiesel nets 29 mpg highway and can tow more than 9,000 pounds, which makes you wonder why it has, as yet, no direct competition. The Rams also have the most ambitious suspension. The 1500- and 2500-series trucks come standard with a coil-spring rear end, so when you’ve got nothing in the bed (which is probably most of the time) they still manage a smooth ride with superior control, none of the rear-end hopscotch that leaf springs can give you on a bumpy road. A coil-spring rear end would be revolutionary enough, but Chrysler also offers the industry’s only available air suspension. Going off-roading? Hit a button and it’s like you installed an instant lift kit. If you’re loading cargo, drop the suspension and you can heave those bags of mulch into the bed without approximating the caber toss at the Scottish Highland Games. The truck even knows to drop the body closer to the pavement at highway speeds to improve fuel economy. 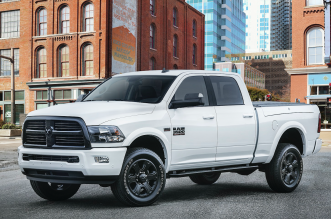 On the heavy-duty side, Ram’s got the most torque (a downright silly 900 lb-ft from the high-output Cummins diesel) and the most powerful gas engine with the 410-hp 6.4-liter Hemi. The trucks with an HD badge also get optional rear air suspension, which means the bed stays level even when you’ve loaded it with two yards of gravel or your pet hippopotamus or a bunch of caber poles. No, the Ram isn’t perfect—the fancy Laramie Longhorn interiors exhibit the aesthetic sensibility of a Reno whorehouse circa 1895—but in terms of fearless ambition and overall goodness, the striver makes a compelling case. You ought to hear it out. Dodge’s use of Cummins diesels back in 1989 succeeded beyond expectations, reviving a nearly dead truck line. When the company added a VM diesel to the Ram 1500, sales were, again, much better than expected. Chrysler had predicted a 10% take rate, perhaps up to 15%; but Allpar reported in August that the line was running up to 25% diesels when the engines were available. Like the Cummins B-series engines, the VM has been both reputable and technologically advanced; and sales have exceeded expectations. Ram announced today that 20% of its pickups would be diesel-powered by November, double its original estimates. This strains VM’s ability to make enough engines for North American Rams and Jeep Grand Cherokees, though Ram worked with VM Motori to raise production. When the Ram 1500 EcoDiesel opened for orders earlier this year, Ram had over 8,000 requests in three days. Some had predicted lower sales, because the diesel is a $4,000 option on the value-priced Tradesman Quad Cab, and requires the $500 eight-speed automatic. Diesel Ram 1500s are rated at 20 mpg city, 28 highway, which beats the fuel economy of every competing pickup — and some midsized and compact trucks, down to imported four-cylinder manuals. The engine generates 420 lb-ft of torque and 240 hp and is highly responsive at low revolutions. The peak towing capacity is 9,200 pounds. Helping to optimize performance, given the limited range of diesel engines, is the wide-range “TorqueFlite Eight” eight-speed automatic. “Being first to market with a diesel engine for the half-ton segment was shown to be a great decision for the Ram Brand,” said Ram chief Robert Hegbloom, adding that nearly 60% of sales were conquests from other brands, unusual in pickups. Other unique features in the Ram 1500 series (not on all trucks) include a fluid temperature management system, various methods of cutting parasitic losses, and active aerodynamics aids. The Ram 1500 earned Motor Trend’s Truck of the Year in both 2013 and 2014, the first time a vehicle of any type has taken the award back-to-back. The Ram 1500 also won the Truck of Texas in both 2013 and 2014. The 2015 Ram 1500 is backed with a five-year /100,000-mile transferable powertrain warranty including free towing, if needed, and a three-year / 36,000-mile “bumper-to-bumper” warranty. The 2015 Ram 1500 is built at the Warren Truck Assembly Plant (Warren, Michigan); Regular Cab models are built at the Saltillo Truck Assembly Plant in Saltillo, Mexico. By now you’ve seen the 2014 Ram Heavy Duty Power Wagon. You know it’s got unmatched off-road capability, and you may have even seen it in action. Whether you’re familiar with the Power Wagon’s capabilities or just starting to check it out, here are a few features you’ll be glad to know come standard. That’s right, the winch is standard. So if you’re taking your Power Wagon out for some off-road fun or need to rescue “the other guys” from a stuck situation, you’ll find yourself well equipped in the Ram Heavy Duty Power Wagon. The Warn 12,000-pound winch is mounted right behind the front bumper, so you can pull up to the scene and save the day … and prove just how powerful your Ram Truck really is. If you’re in the market for an off-road vehicle, we know you’ll want to be pushing it to the limits. That’s why the 2014 Ram Heavy Duty Power Wagon also comes standard with the unique Ram Articulink front suspension system. High movement joints and the sway bar disconnecting system give you increased control over your axels, so you anticipate bumps in the road with excitement, not dread. Why go the four-by-four route if you aren’t going to go 100%? Front and rear electronic-locking differentials come standard on every Ram Heavy Duty Power Wagon to give it true four-wheel drive and maximum traction. You’ll be in control every bit of the way. Of course, this isn’t all the Power Wagon has to offer. You know it comes with a 6.4-liter HEMI® V-8 with best-in-class 410 horsepower and 429 lb.-ft. of torque … all this featuring an unsurpassed powertrain warranty of five years or 100,000 miles. 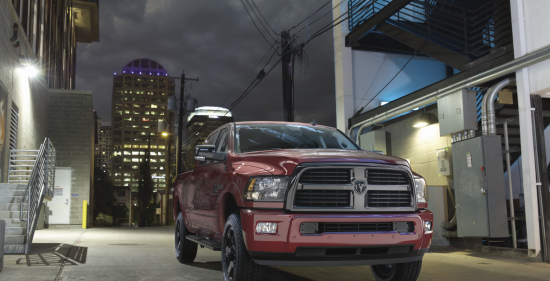 Equip it with a Ram Box, and you’ll be the envy of every other truck on (or off) the road. Ram has confirmed that the Ram 3500 pickup still has a 30,000-pound towing capacity when tested under SAE’s J2807 standards. Ford, which has, until now, avoided the SAE standard, is now saying that its claim of 31,200 pounds for the F-450 pickup also meets the standard, even when the 150 pounds of “customer-deletable” items, like the spare tire, jack and center console, are added back in. This answers questions about towing capacities but fails to answer the question of who is best in Class 3 towing, because the F-450’s credentials as a direct competitor to the Ram 3500 are dubious, at best. The primary criterion for being in Class 3 is having a gross vehicle weight (GVWR) — payload plus curb weight — at or below 14,000 pounds. Ford claims that both its top F-350 and its sole F-450 pickup have the same GVWR, 14,000 pounds. The GVWR is set by the manufacturer. The Ram 3500 is a true Class 3 pickup, meeting the standards in curb weight trim. The Ford F-450 pickup, unlike every other model in the F-450 range, is built on an F-350 chassis, but uses Class 4 components. Ford originally skirted Class 3 limits by stripping standard equipment from the F-450 and redefining the term “curb weight.” In other words, a customer buying an F-450 with all the stuff it is supposed to include, such as a full tank of gas and 300 pounds of driver/payload, will likely find their truck’s curb weight actually falls into the Class 4 weight range. So is the F-450 Super Duty a Class 3 truck? If so, why doesn’t Ford call it an F-350 and drop the current model? Perhaps it’s an F-400? A F-350 Super-Duper Duty? An F-350½? The Ram’s claim is rooted in the fact that the Ford F-350, Chevrolet Silverado 3500 and GMC Sierra 3500 cannot tow as much as the Ram 3500. Therefore, the Ram claim is supported. The question is, why does Ford simply not say the F-450 has the highest towing capacity of any factory-built pickup? Since no other standard pickup is rated to tow 31,200 pounds, that would be true. It might also help justify the extra $10,000-plus for the F-450 compared to either the Ram 3500 or the Ford F-350. What to Know Before you Tow! It’s that time of year again! More trailers are on the road during the summer months than any other time of the year so making sure that your trailer is properly prepared can mean the difference between life and death for the family in the minivan behind you. For that and so many other reasons, it’s important to take towing seriously. There are some simple rules to remember when hooking up so that your trip doesn’t end up a disaster, many of which apply from the largest car carriers down to the smallest scrap haulers. First, you need a properly equipped vehicle. Just about any car on the road can be fitted with a hitch and it is important to consult the owner’s manual of your particular vehicle to find out how much it is rated to tow. Ideally, you shouldn’t be pulling more than 75 percent of the listed maximum for a safe feeling load. Hitting or exceeding the maximum weight not only puts extra strain on your vehicle, but it also makes driving more dangerous. That is why pickup trucks and SUVs are commonly used for hauling, because their heavy curb weights allow heavier loads to be controlled more easily. Powerful engines and body-on-frame construction also qualify pickups and SUVs over cars, but they aren’t essential for all hauling jobs. There are also different types of hitch receivers ranging from class I to class V, with each designation representing how much a hitch can tow, how that particular hitch is set up and what type of specific hardware must be used. Class IV hitches are the most common and can be found on most new half-ton pickup trucks like the Chevy Silverado, Ford F-150 and Ram 1500. SAE says that a Class IV can tow up to 12,000 pounds gross-trailer weight and 1,000 pounds of tongue weight. It must use a two-inch hitch receiver opening, which has to use a five-eighths inch pin to secure the ball mount in place. The ball itself must be a minimum of 1.25-inch diameter. Starting with the proper hardware for your hitch is essential, and getting the right size hitch ball is a big part of that. Different trailers call for hitch balls ranging from one and seven-eighths of an inch up to 2.5 inches. Making sure the ball is the right size for the receiver will ensure a safe connection between your vehicle and the trailer, but that’s only the beginning. Weight distribution is one of the most important factors to consider. As you increase weight on the tongue of the trailer, the rear end of the vehicle will sink, causing the front end to lift. That puts more strain on the rear suspension and reduces contact between the front tires and the road. In turn, that means less stopping power and reduced steering ability. Tongue weight – the actual amount of downward force being put on the rear end of the tow vehicle – should be between 15 and 20 percent of the overall trailer weight, though that can be tough to measure accurately. The easy way to check for proper weight distribution is to eyeball your rig and make sure that both the vehicle and trailer are sitting flat. There’s more than one way to combat poor weight distribution. Ideally, you want about 60 percent of the weight on the trailer to be on top of or in front of the axle, distributed evenly from side to side. If you are hauling an ATV or a snowmobile, this is easily achieved by simply moving the machine until the weight is centered. With something like a travel trailer or a load of gravel, where you can’t simply shift the weight around, there are still ways to achieve proper weight distribution. Hitch height is an important part of this. Measure from the ground to the top of the hitch ball on both your vehicle and trailer to make sure your tow vehicle isn’t too tall, or too short for your trailer. If the two numbers are different, the difference can be addressed with a drop hitch. Some drop hitches are actually adjustable, which is an ideal setup if you plan to pull more than one trailer with the same vehicle. These adjustable setups will usually also accommodate a trailer this is taller than your tow vehicle as well, although that isn’t as common. If your hitch height is perfect but you near the vehicle’s maximum tow rating, odds are the rear end of your vehicle will still be sagging, the solution for which is a weight-distributing hitch. This type of hitch will spread the weight on the tongue out onto the trailer axle and to the front wheels of your tow vehicle, helping to achieve a flat ride. There are several rules to keep in mind while hooking up your trailer, but one reigns supreme: never rush. Taking the time to double check connections and tie downs can mean the difference between arriving safely and going to the hospital. With that in mind, the next step to hooking up is backing your vehicle up to the trailer. You always need a spotter to guide you into position with your hitch ball sitting underneath the hitch ball housing. Once lined up, open the handle on the ball housing and drop it onto the ball using the tongue-mounted jack. Close the handle on the housing and your trailer is now hooked up. But you aren’t ready to hit the highway yet. Always use safety chains to ensure that your trailer will remain attached even if the ball somehow becomes disconnected. The key thing to remember with these chains is to cross them. The left-mounted chain on the trailer goes to the right side hookup and vice-versa. That way, if the tongue of the trailer falls off, the chains will act as a cradle and keep it from dragging on the road. Once the chains are on and the tongue is hitched, it’s time to connect the lights. Most modern pickups and SUVs are fitted with receivers for both four-pin and seven-pin connectors. Adapters are available to make sure you can hook up the lights if your vehicle isn’t fitted with the right connection. Smaller trailers generally use the four-pin setup, while larger trailers tend to use seven-pin. The difference is that larger trailers usually have their own brakes. As a side note, make sure the connector is off the ground and covered to prevent it from rusting when the trailer isn’t in use. If your connection isn’t working, try spritzing it with WD-40. Sometimes that’s enough to solve the issue. So now your trailer is properly balanced, the safety chains are on and the lights are connected. That means it’s time for a circle check. Commercial vehicle operators are required to walk around their entire truck before driving on the highway and it’s a habit that is important for personal vehicle owners as well. Start by double-checking all of the connections at the hitch. Then walk around the trailer looking for any problems that may arise. Specific things to watch for are tire pressure , anything loose on the trailer or debris lodged in or around the axle. Make sure to check that all of the lights functions are working properly as well. Finally, make sure that whatever it is that you are hauling is secured properly to the trailer. And that’s it! You’re ready to haul. Whether you’re taking toys out for a weekend adventure or hauling a load of scrap to the dump, towing can be hugely helpful and even fun as long as you remember to take it seriously.